One of the problems with gas smokers is that the heat output can be limited by a factory who thinks they know best. While smoking is done in a specific temperature range, it should be up to the user if they want to "flash" smoke or do a low-temperature smoke. This Camp Chef smoker has a temperature range from 160 to 400 degrees F so it is much more versatile than many gas smokers on the market. 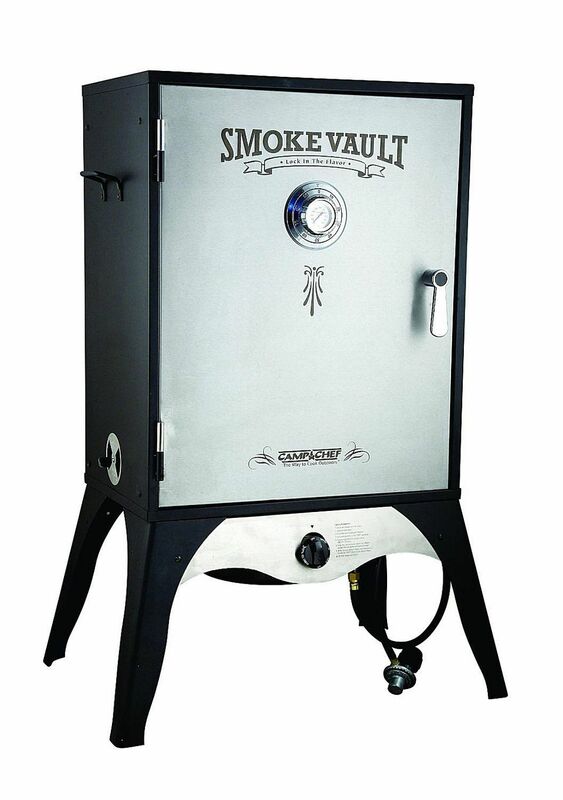 However, like many most box style gas smokers, the body isn't insulated and though the door on this one fits better, you still get smoke leakage. The problem with electric smokers is that to get up to the high end of their temperature range with 120 volts there is a good chance that it will blow the circuit breaker and care must be taken with extension cords. The answer is to go with a propane powered smoker. Just like on a stove top, gas is more powerful and responds faster when the heat is adjusted. The problem is that anyone who makes gas appliances these days seems to think that they can turn out a gas smoker for cheap and sucker people into buying it. To be honest to make a decent gas smoker you need a box, a burner, and some racks to hold up the food. Yes, a pan for water and a pan for wood chips certainly help, but so does a door that closes properly so that all the smoke doesn't leak out before it reaches the top of the box. Making a good gas smoker shouldn't be that hard, but it turns out to be a little too much for many. This is partly due to the fact that most big box stores don't think a gas smoker should cost much more than $100 USD and because most of them are made in China and to make a profit they can't weigh much more than 40 pounds. Yes, Camp Chef makes this smoker in China, but they actually seem to care about the products they produce and their customers. While this smoker is small and more expensive than similar products, it is better built and best of all it isn't limited by some engineer who thinks he knows more than you do. The temperature range of this smoker is 140 to 400 degrees F. This is important because it hasn't been limited and it can hold on to enough heat to hit higher temperatures. As the Camp Chef website says, this smoker can be "used for smoking ribs, fish, and turkeys as well as baking pies and breads". Add to that pizza, because you can actually crank this smoker up high enough to make a decent pizza. The weight is a little like, and the metals are thinner than I would like, but this is a well-built gas smoker that is actually worth buying. This model has a better capacity and shape than the less expensive Smoke Vault 18.